Members of Dr Blok’s school governing body (SGB) said they are overwhelmed and have much appreciation to all those Good Samaritans who have been involved in the restoration and donation of goods received by the school following the fire that ravaged the boarding master’s living quarters on Friday evening. 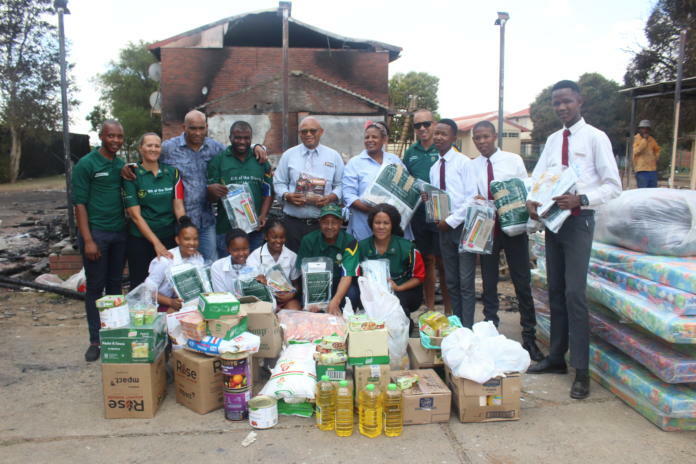 The chairperson of the body, Lerato Baartman, told Bloemfontein Courant that they have been receiving many donations from parents, non-profit organisations and the provincial government and are still receiving items to help those affected by the recent fire at the school in Heidedal. “The community has helped with clothes and the same applies to the government. The mayor, Olly Mlamleli, was here and she brought blankets, sanitary towels and school shoes for the children.The local churches assisted with stationery. Grey College also donated food even though we did not lose food,” Baartman said. She told Courant how they were traumatised by the news of the incident and feared for the lives of pupils but luckily no one was physically hurt by the incident. Cleaning operations have commenced at the school to try and get things back to normal. The principal of the school, Daniel Mac Pherson, also voiced his appreciation for the assistance received by the school from different donors. He said the blaze had completely destroyed the boarding master’s quarters but only partially damaged the girls’ hostel while the boys’ quarters were safe. “We are planning a media briefing to show our appreciation to those who selflessly helped our needy learners,” Mac Pherson added.